When my brother and his new wife were married at our home this summer, our Mom brought Mexican wedding cookies. Every year they also appear at Christmas. They’re a lovely, buttery little cookie, tasting of toasty walnuts and covered with a dusting of white. They look like a snowball rolled downhill to me and seem so right on a plate of holiday cookies. But, somebody named them first, so Mexican wedding cookies they are. We’ve had a busy four or five days. We’d feasted on Thanksgiving with fifteen around our table. Friday we finished cleaning up after the feast and then briefly braved the crowds. Saturday, after pulling boxes and boxes from the attic, our Christmas tree was lit and dressed with ornaments collected over years. Sunday, we had family for breakfast before they headed out of town. With no precise plan for the rest of the day, a little slow and easy pre-holiday baking sounded more restful than a nap. I’d made this snowy little confection recently as part of a cookie platter we took to a party. I do remember pulling the recipe card from its sleeve inside a large binder, but its space was now vacant. I looked in files I keep near by desk, files filled with ideas to sample and recipes I intend to post. Not there. I looked in my cookbooks, thinking maybe I’d used the recipe card as a bookmark. (Truth is: I looked in each of those places several times, disbelieving my eyesight the times before.) I looked in all kinds of unlikely places too, places I’m a bit embarrassed to confess. (Might I have left it in the laundry room on one of my many trips there? You never know.) But gradually it became clear: Mom’s recipe had gone missing. Plan B: I’d seen a recipe for the same cookie in a special baking issue of Cook’s Illustrated and I’d wanted to sample it anyway. Thought I’d try it side-by-side my mom’s. The side-by-side would have to wait. 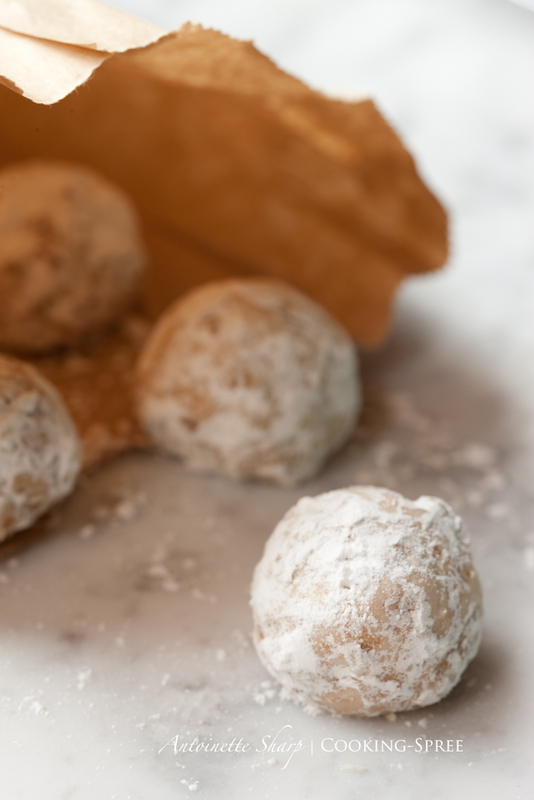 This cookie is one tender, melt-in-the-mouth, dribble-a little-powdery-sugar-on-your-sweater bite of deliciousness! And yes, every once in a long while, we may need to update our notion of perfection. While enjoying a cookie or two with a cup of tea, I combed through some cookbooks that had come down through my mom’s family, some of them from as far back as the early 1900’s. Some of the ingredients, wow! At least a couple dozen updates to “perfection” have to have taken place since then! Adjust oven racks to upper-middle-and lower-middle positions. Preheat oven to 325°F. Line 2 large baking sheets with parchment paper or use silicon mats. Using a food processor, grind 1 cup of walnuts to coarse cornmeal texture (10 to 15 seconds.) Transfer to medium bowl. Using either the food processor or chopping by hand, coarsely chop the remaining cup of nuts. (5 seconds in food processor.) Transfer to the same bowl and add the flour and salt. Working with one tablespoon at a time, press and roll dough together into balls and lay on prepared sheets, about 1 inch apart. Bake cookies until pale gold and the bottoms are just beginning to brown, about 18 minutes, switching and rotating baking sheets halfway through the baking. Allow cookies to cool on the cooking sheet for 10 minutes, then move to cooling rack to cool completely, about 1 hour. Using either a bowl or a paper bag filled with confectioners’ sugar, roll the cookies to coat. Just before serving, re-roll and gently shake off any excess. NOTE: To make your own superfine sugar, simply process 1 cup + 2 teaspoons white sugar in a food processor for 30 seconds. Yield:1 cup superfine sugar. The advantage to using superfine sugar in some baked goods is how easily it dissolves; the superb tenderness; and the delicacy and/or crispness it imparts. For a printed copy, click. Oh Mama, I trust that recipe will show up somewhere. We do love them so. This Cooks’ recipe sounds like a good resource, though. I must say, the sight of those cookies in front of the Christmas lights has put me in the mood for Christmas like nothing else has this year. I’ve wanted to hunker down in the autumn and Thanksgiving place. But after this, Christmas might just start coming to our house sooner than I’d thought. Beautiful! Thank you again for the loving and lovely inspiration. Those look fantastic. I’d use pecans, we always have them on hand. These go so fast at a buffet too, something about powdered sugar! Awesome, I just saw you were Freshly Pressed! These are a tradition at our house for Christmas too. I think we use pecans though. I’ve heard this from a number of people. We’ve had them both ways and wouldn’t ever want to have to choose between the two, but walnuts I always have on hand. These look very similar to “Russian tea cookies”, which I think are made with a pecan dough. Are they pretty much the same thing? Karl, many aliases for this cookie and, yes, Russian Tea Cookie is one. As far as I know, no culture refers to them as little snowballs which means a whole lot of folks are missing the obvious! A lot of recipes out there for this cookie of many names, but this is truly a great one! My Mom called hers “Russian Tea Cakes” and used Pecans, too. I have a recipe in a Mexican cookbook that calls for pecans or walnuts. I have one recipe card that calls them “Snowball Cookies,” and I think it is in my grandmother’s handwriting. They have always been a part of our Christmas cookie repertoire as they last a long time in a tightly closed container and taste better after a week. Ah, thanks for mentioning how well they keep! I store them airtight in a little bed of powdered sugar and they hold up so well. And freezing will keep them for months. Thanks for clearing that up. My grandmother (from Slovenia) made them crescent-shaped and as kids, we called them “false teeth cookies”. I like the round snowball shape better, but the taste is the same–delicious. I hate desert most days, but these cookies are some of my faves – up there with white pie and pumpkin dump cake. Great shots and nice site! Yummy Now I want some…I have to try this recipe! Wow! Totally distracted by the beautiful quilt under your cookies! Really good photos, and they look delicious! Congrats on making Freshly Pressed! I’ve had these cookies before – they are delicious. As usual love your photos – Thanks for sharing! Beautiful photos! Will try the recipe too, something new to try here in the UK! : ) I just spoke with my mom. The recipes are very much the same, with only a couple minor variations. She uses salted butter. I bake with unsalted and add salt. Proportions were the same but in the recipe I posted today, half the total nuts were ground to allow for the nut oils to mix with the flour. It did make for an even more tender little cookie! And thanks for the congrats! The Mexican Wedding Cookies look absolutely scrumptious and I’m definitely saving the recipe! What a delightful post! beautiful photos! We call these Russian Tea Cakes in our family. I love how everyone has a different name! The cookies look yummy. And your photos are glamorous. Nice post! I love that you started this post with a story about your holiday events. Really drew me in, and got me in the spirit to bake! Which is something I don’t do that often. Cooking, yes. Baking, no. My husband started a new job today and I was wondering what to make him as a surprise. Now I have the perfect idea! Thank you so much for the suggestion. Plus, the kids and I now have a fun afternoon activity (they love the food processor!). The kids helped with everything, from using the hand mixer, to — their favorite — rolling the dough into little balls. And I gave them each a bag with powdered sugar in it for the final step — I have to give this a Kid Stamp of Approval. Such memories are tied to these “Little Snowballs”! Yaya coming to the house with plates full of these and others. But these were my personal fave. Love the way they bust in your mouth like a good shortbread and shower your taste buds with walnutty goodness. Oh you said it so well, Don! I’ve never been to a Mexican wedding but those look delicious. Merci for sharing and for the recipe. I might try those when I get back home. 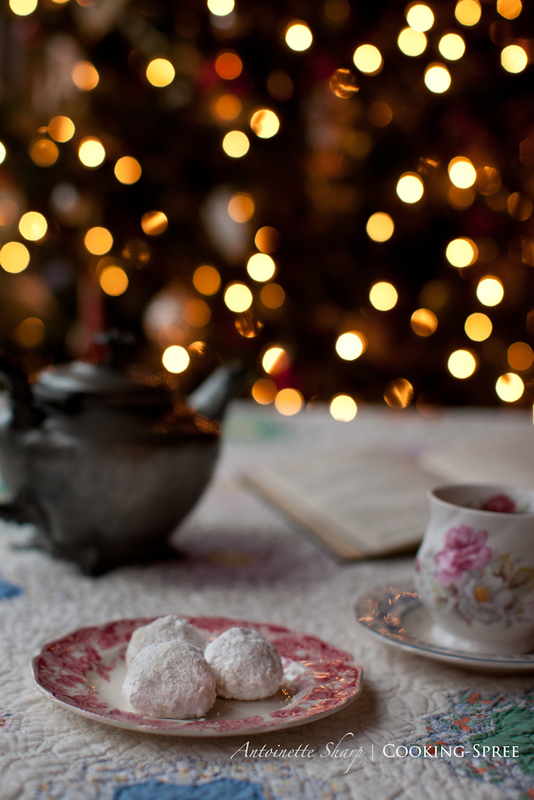 I love that you started this post with a story about your holiday events.The cookies look yummy. And your photos are glamorous. Nice post!Thank you again for the loving and lovely inspiration. 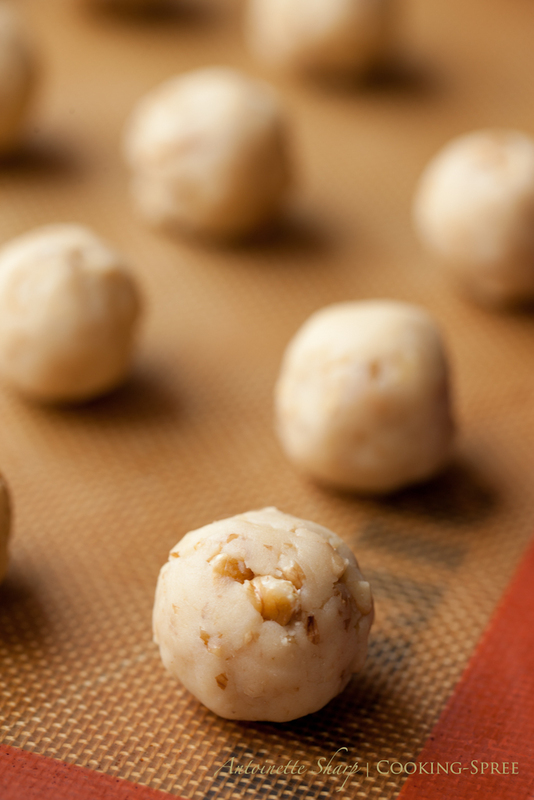 Make that Russian Tea Cakes…and yes, with pecans. Mom made hers at Christmas only, and they’ve always been my favorite…always remind me of her. These look really good, must give them a try sometime! You do MariAnna?!?! OH Yay! Finally someone knows to call them by their only “true” name! This is what they call them in Holland then? Lovely! Congrats on the FB! I love the pictures, too! Thanks for sharing! Love it!! Thanks for leaving such a great comment! I was just wondering this morning…. hmmm…I wonder how I’ll tweak these little beauties, give them a new twist, something new to write home about. I love your idea! And I know some pink-loving little girls who would too. growl* Those look delicious. Great photos, they appeal to my stomach right now !! mmm…Russian Tea Cakes! My aunt makes these and they are amazing. My mom and I tried her recipe once and they were not the same – I think she’s holding back a secret. Ours were good but did like disintegrate like hers do! So now they are “her” cookie! I can’t wait for Christmas! These look amazing! Well done. Can’t wait to make some! Ahh…an old family favorite. We always called them Russian Tea Cakes, but what’s in a name, anyway? The mere thought of them puts me in my mother’s kitchen at Christmas time. Your images are delicious. Congratulations on being Freshly Pressed- every WordPress blogger’s dream! Very little connects us with our family the same way food does, don’t you think? mmm, thank you so much for your comment! Thank you for sharing! Sounds totally yummy – I’ll make them for Christmas party in Texas! I predict a hit! Have fun. Oh how I love these cookies! I call them Snowballs, and always use pecans. Such a wonderful treat! I have yet to meet someone who doesn’t love ’em! these photos make me hungry! can’t wait to try this recipe! These look great! Will definitely have to give this a try 🙂 Its always a great feeling when you experiment with additional perfecting and it turns out good! Congrats on being freshly pressed! What a great recipe (and gorgeous pics!). My roommate has tried to find an easy-to-make version of this cookie; I’ll have her give yours a go! My family is Greek and we have a version as well. Now that you have me started I’ll have to look it up. We call them Kourabiedes (which doesn’t mean anything as far as I know) however I DO know this. My mom adds some cognac to the dough and pokes a clove in the middle of every one. I remember being a kid and loving the taste of the clove but being careful not to bite it cause it bites back! I wonder if these cookies started east and went west or the other way around…from Russia to Mexico and back! Oh! My father was Greek! I posted a recipe for Kourabiedes in a previous post! I love the idea of the cognac – and a clove in every one! Thanks so much for taking the time to comment! Here’s the link to the recipe I use, but I’m going to try cognac & clove! My mom and I make these every Christmas and WE call them Snowball Cookies!! Your pictures are gorgeous! Another vote for Snowball Cookies! Do you CALL them Mexican wedding cookies? Well, I don’t suppose it matters, so long as you don’t wait for a wedding to eat them! thank you so much – i can’t tell you how many cook books I have purchased looking for this recipe. yay! Super beautiful tribute to such a spectacular treat! we have made these wtht our mother and Nana since we are kids..and t is so nice to see them here! Gorgeous photos…beautiful post! Haha i love these! My mom makes em every year at Christmas! They are so delish! These are my favorite cookies. I also see ’em called Russian tea Cookies. Whatever they’re called, I looooooove them. those Mexicans sure can cook! The cookies look devine. Delicious looking food + nice lighting behind = great mood! I loved your description of the cookies, especially the “dribble-a-little-powdery-suger on your sweater” kind of cookie. Such a great image as we delve into the plate of those wonderful little cookies. Wow! Those cookies look absolutely devine. I will try making them one day for sure! … First time on your blog and let me say it’s so beautifully presented and your photography is wonderful. Nice of you to leave a comment. Thank you MJ! I really have to make these this year. I always enjoy them at Christmas! These are my favorite cookies! Your pictures are awesome! This photography makes my heart swoon! This is a staple in my mother’s famous christmas cookie plates. Can’t wait to pop one in my mouth on Christmas day! MmmMmmMmm!! I love this recipe! Definitely a must for The Holidays!! 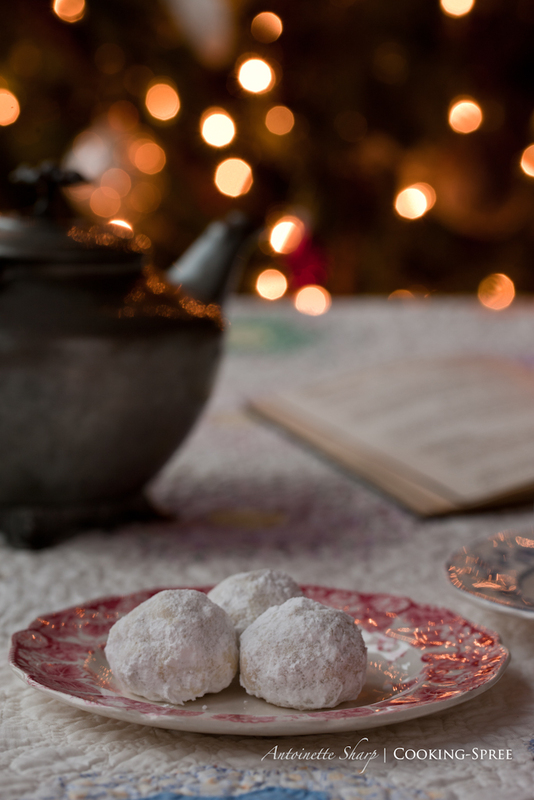 Thank you for a sweet story about a sweet cookie – although I have always called them Russian Tea Cakes – funny how we all have our own little traditions! These look delicious and your photography is amazingly beautiful! Oh my gosh, these are the exact cookies that my mom used to make and they were always my favorite. They just melt in your mouth and my mom also ground the nuts. This sure brings back memories of Christmas for me as a kid. Thank you and great post. Oh my! These are definitely going on my “to bake” list!! I’ve actually never heard of these. but they look delicious! The images are very nice, the cookies may be nice too by the look of them. Love it. Nice photos, too. My family calls them Pecan Dainties and we usually make them for Christmas. I’ve also heard them called Russian Tea Cakes. Gorgeous photos. Wonderfully evocative writing. Well-done, all around! Yummo-liscous! We have a southern sorta recipe like this…. Me too. Thanks for leaving a comment! Congratulations on being Freshly Pressed and I am going to make these cookies for Christmas with the family. These look wonderful, and while my grandmother (Antonia) did not make these, I have always wanted to have my own family recipe for my favorite cookie. I might adopt this one. 🙂 I just found your beautiful blog on freshly pressed. I love it all. Thank you. congratulations on being “freshly pressed” its my first time on your blog and it was the beautiful photo that caught my eye. Your recipe looks delicious, I will have to try these. Sounds like I just found the new cookie to add to my Christmas collection! Thanks! Ever tried them with almonds, or macadamias (an Aussie fave)? I’m so tempted to try these with a few different varieties, or blends, of nuts. No, I haven’t tried with macadamia or almonds. My thinking is though that almonds wouldn’t work as well as pecans or walnuts, both of which have a higher oil content that makes these cookies so tender. Macadamia – I love them but again, not sure about the oil content. Please let me know if you try though! Oh dear, these look amazing!! My mouth is open now… and the pictures are so lovely! Thanks for sharing! Thanks for the recipe I think I’ll try it out sometime. it’s traditional Indonesian cookies, hehehe…. Yummy looks so good. Thanks for sharing. This was wonderful to read, these cookies were one of the ones my mother always made for Christmas too. They are one of my favorites. After reading this I think I will get out her recipe and give it a try (might try your new recipe too). Brings back great memories…Thanks. Mmmm I love Mexican wedding cookies. Thank you for sharing. Your pictures are beautiful too! Congratulations on being freshly pressed! You always have great recipes! Really beautiful post with wonderful images. I make a similar recipe but with almonds and nutmeg. I must try yours, lovely. Those look great. My grandmother made something similar but it wasn’t called that. I’ll have to try it! Wow! I’ve never heard of these. They’re beautiful…and look delicious! Every day’s a school day, eh?! My mom made these growing up, just looking at them make me excited for Christmas! Thanks for posting! Yum yum…can’t wait to try this recipe this weekend! Yum! These remind me of Christmas with my grandma. I’ll have to try this recipe out this year. I adore your photos of these tasty treats. Excellent post! Thank you thank you thank you! Your post reminded me that I’ve been meaning to try these. Thank you for reminding me that these exist. I will add them to our list of christmas cookies to make this year. Your imagery is beautiful. looks yummy and very festive! I’ve had them before but never even considered trying to make them myself. Thank you for posting this recipe and congrats on being Freshly Pressed! This is a wonderful recipe! It’s almost identical to one I’ve used – with the notable exception of superfine sugar. I’ve always used standard confectioners sugar whipped into the butter and about 1 1/2 tablespoons less flour and 1/2 teaspoon of almond extract. I will definitely be trying this version soon! It is also quite the delicacy when almonds or macadamia nuts are substituted for walnuts or pecans. Great post and congrats on being freshly pressed! Pro-tip: try using black walnuts mixed with regular. the cookie packs a totally different punch. Num num. Looks and sounds a-ma-zing! Will be trying that out this weekend! Thanks! I’ve always wanted to try these and yours look delicious. I love all of your photos too! Thanks for the share of theses easy cookin lovely lookin cookies. I may consider giving it a shot, but they kid of remind me of powered donut munchkins! These are my favorite Christmas cookies of all time. Must make a batch this year to share. Great photos..
Love the story behind these… and the use of the superfine sugar! I’ll have to sub that in when I make them this season. These will make wonderful Snowballs at my Christmas party this year! Thank you so much! Hi Antoinette, I unfortunately don’t know you as well as I feel I should, but I LOVE your daughter Ali & her expanding family, and I am so thrilled for you and your bursting at the seams blog! I adore all of your posts, and am currently getting ingredients out to make the Mexican Wedding cookies with my daughter, Chloe to bring to a Duck game with friends tomorrow. Go Ducks & Go YOU !! The cookies sound wonderful and I love your photos. Hey your images are fab! Especially the lights in the background. Seem to light up the whole image. Do drop by my blog sometime, I just did it first ever dessert recipe post and I’d love to know what you think. i want to eat these cookies. where can i get these kind of cookies…. I am so looking forward to giving these I try when I get home- I thought you guys might be interested in them too. I’ve been making these cookies during the holidays for years. I’ve always called them Butterballs tho… Yum! Your photographs equally dazzle and comfort. Sigh. Delightful and beautifully seen pictures. Lovely post. My Italian family makes these exact cookies except with almonds and almond extract instead of walnuts- I agree, they’re to die for! Thanks for the recipe! It looks really delicious. Can’t wait to share this recipe with our brides from the wedding registry! I appreciate so much your comment Marla. I’m not sure what to think. (This sort of thing has sometimes happened on my iPad, but I’m checking right now on my computer and all images are loading properly.) Sorry you experienced a bump here! And again, very thoughtful of you to let me know! That seems like alot of salt for a cookie recipe.. do they taste salty at all?? Can the salt be cut down?